German rabbi; born at Dessau Sept. 18, 1833; died at Bonn March 6, 1901. The son of a rabbi and teacher at the Herzogliche Franzschule at Dessau, he began the study of the Talmud in his early youth. After his matriculation he studied philology and philosophy at Berlin, where he also continued his Talmudic studies. In 1860 he received the degree of Ph.D. from the University of Leipsic, his thesis being "Philosophischkritische Abhandlung über den Schlussvers des Zweiten Buchs der Psalmen." After officiating for five years as preacher and religious teacher at Waren, Mecklenburg, he went in 1867 to Bielitz, Austrian Silesia, as director of the Jewish communal school there. Five years later he became preacher at Oels, where he officiated until 1882. In that year he was appointed rabbi at Bonn, where he remained until his death. 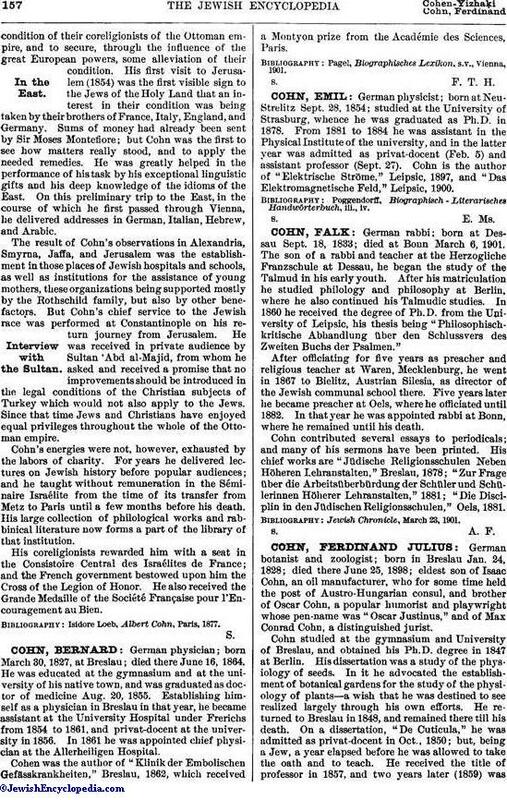 Cohn contributed several essays to periodicals; and many of his sermons have been printed. His chief works are "Jüdische Religionsschulen Neben Höheren Lehranstalten," Breslau, 1878; "Zur Frage über die Arbeitsüberbürdung der Schüler und Schülerinnen Höherer Lehranstalten," 1881; "Die Disciplin in den Jüdischen Religionsschulen," Oels, 1881. Jewish Chronicle, March 23, 1901.